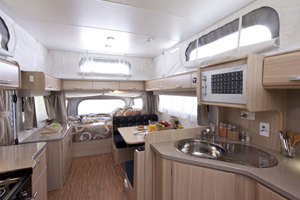 This fantastic 6-berth Jayco Expanda caravan is fully equipped for the perfect family holiday. All creature comforts are included – air-conditioning, TV with DVD player, microwave cooker and more! Families and small groups love this caravan. It’s roomy, comfortable and easy to set up. 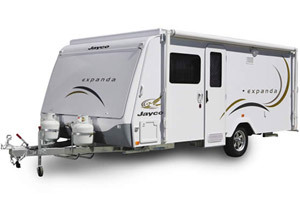 Perfect for people who want to stay for a few nights at each campsite, the Jayco Expanda can be set up at base camp, leaving you free to explore. 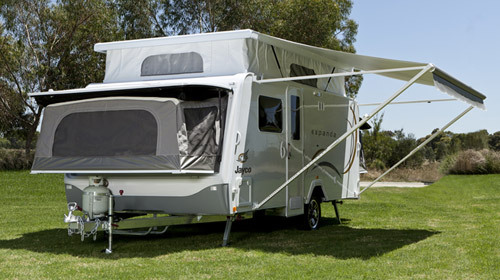 The caravan plugs into mains power at your preferred campsite. For campside relaxing and chatting with friends, there’s a roll-out awning. Inside, there are 2 full-sized queen beds and 2 bunk beds. There’s even a couch when you fold out the bunk beds during the day. Hire one of our 4WDs or bring your own six cylinder or 4WD vehicle. Vehicle must be fitted with a heavy duty tow hitch. 6cyl car or medium 4wd can tow this caravan. Note: this is an on-road caravan (not suitable for off-road camping).